The City needs YOUR help! 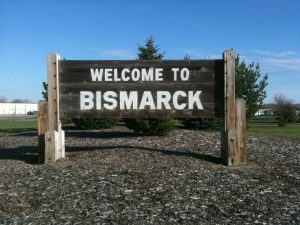 Bismarck is currently undertaking a Strategic Plan Update. The process will completely update the City’s Strategic Plan, focusing on the future and informed by Bismarck’s rich history. The City of Bismarck Strategic Plan was adopted March 27, 2012 through a collaborative process of engaging citizens and community stakeholders. Over the next several months, the City will be asking you to lend your talents, thoughts, experience and wisdom to build a NEW strategic plan. Take and share the Vision & Values survey now through October 31 to help set the target for the future of Bismarck! 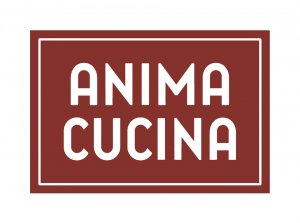 The owners of Fireflour Pizzaria and Coffee Bar are adding a new restaurant to Downtown on 5th and Main which is currently under construction. Follow them on Facebook for updates (click logo above). 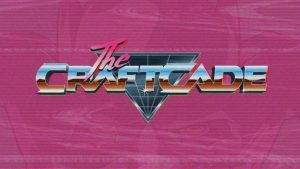 A new business concept is coming to Bismarck, an arcade/bar-restaurant call the CraftCade is currently renovating a space next to Glance Spa & Salon on 4th Street. The business will feature retro video games, pizza, brews and more. The “barcade” concept has taken off nationally including regionally in Rapid City, Fargo, Minneapolis. This will be the first of its kind in Bismarck. Find them on Facebook for progress updates (click logo above). Thank you to all our sponsors and supporters for being a part of the 45th Annual Downtowners Street Fair, a longstanding annual Downtowners and Bismarck-community event! Crowd estimates were 68,000! 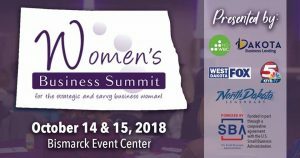 A big huge gigantic THANK YOU to our dozens of volunteers, supportive businesses, hardworking vendors, talented Buskers, and of course our great Sponsors & Supporters: U.S. Army, First Western Bank & Trust, AARP, Your Home Improvement, Jacobsen Music, Townsquare Media Bismarck, Dakota Fence and HealthSource Chiropractic. The Bismarck Cancer Center will be hosting the 7th Annual ‘Paint the Town Pink’ event. Downtown Bismarck businesses will be raising awareness as you shop, eat and drink at participating businesses throughout the day while they support the Bismarck Cancer Center Foundation by kicking back a percentage of sales or making a donation to help those battling cancer. 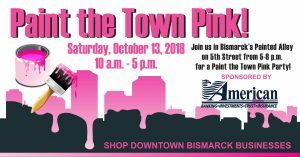 The day will end with a Paint the Town Pink Party in Bismarck’s Art Alley from 5-8pm. The night will include music, appetizers, and pink cocktails along with a silent auction and cancer survivorship celebration. $10 tickets can be purchased in advance or $15 at the gates, while supplies last. Missouri Valley Family YMCA will host ‘Ruff in the Rouzie’, a furry friends fundraiser for our “You are Y” community programs. 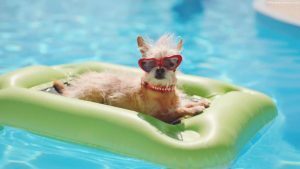 Things are going to get “ruff” in the Rouzie pool before it shuts down for the remodel of the new First International Bank and Trust Family Splash Center. Bring your furry friends for a hour of splashing and swimming. Each puppy will get a free treat bag, courtesy of KT Animal Supply.